Al-haqq means the truth which denotes the undoubted evidential reality. The Arabic verb haqqa means that something is provedor made manifest as mentioned by Allah, Praise and Glory be toHim, “One for whom it is right to say nothing but truth about God” (A‘RAF, 105); whereas haqeeq means true, worth of something or keen on it; He says, “The Sure Reality! What is the Sure Reality?” (HAQQA, 1, 2), the sure reality or truth, the event that must inevitably come to pass; the state in which all falsehood and pretence will vanish, and the absolute truth will be laid bare. Al-haqq may also mean the Qur’an, justice, truthfulness, wisdom, resurrection, and the perfection of things. Allah, Praise and Glory be to Him, says, “Then the Blast overtook them with justice!” (MU’MINUN, 41), “It is He Who created the heavens and the earth in true proportions” (AN‘AM, 73), “What cause can we have not to believe in God and the truth which has come to us” (MA’IDA, 87), “And now they reject the truth when it reaches them” (AN‘AM, 5), “Such in truth are the believers” (ANFAL, 4). Things are distinguished by their opposite; everything that we are informed of is either exclusively false or exclusively true, or it may be false from one aspect, true from another. What is absolutely false is the thing that is impossible because of its nature, and what is absolutely true is the thing that is possible by itself; Allah, Praise and Glory be to Him, says, “That is because God, He is the Reality; and those besides Him whom they invoke, they are but vain Falsehood.” (HAJJ, 62). What is possible by itself and mandatory by something is false from one aspect, true from another aspect. In other words, what can not exist on its own is false and untrue, and once it comes to exist (that is to say when Allah creates it), it becomes true. As it has no existence it is untrue, as it exists through the power of the Creator, it is trueand real. From this, we can deduce that as Allah is the only One Whohas true existence and had been existing since eternity, then He is theeternal TRUTH. He says “Everything that exists will perish except Hisown Face.” (QASAS, 88). 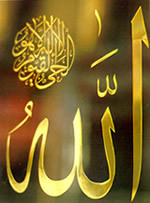 Glory be to Allah Who has been existing since eternity; He is the TRUTH for ever and ever; everything, save Him, does not deserve to exist in itself; hence the absolute TRUTH is Allah, because He is the only One Who exists without the need of anything to make Him exist, and every truth derives its essence of truthfulness from Him. The best knowledge that deserves to be known is our knowledgeof Allah and His Existence; as for knowing anything save Him thiscan not be attained except for the duration of its existence, once thisthing perishes all the data and the information about it becomes false. Speech could be described as true or false; the most truthfulof all words are the words we utter on declaring our profession of Monotheism (There is no god but Allah); it is the only true statement eternally and permanently. So we can describe things as (true) if they exist, literally on tongues, picturesquely in minds, or if they are sighted and seen. Yet the only One Who deserves to be the TRUTH is He, Whose existence is eternal and permanent and knowing Him and professing the belief of His Existence had been true eternally and permanently. He is the TRUTH, Glory be to Him, He is Allah.